Brings together the richness of sweet butternut squash with fresh and slightly tart flavour of apples for a delicious soup. Slow roasted to caramelize the squash, and enhanced with traditional fall flavours of cinnamon, nutmeg and cloves, you might wonder if you aren’t eating dessert! It truly smells that good, and it tastes even better. One of the key differences between this and say, pumpkin pie, is the use of the fresh ginger, instead of powdered. The fresh ginger brings a slight spice, with a touch of citrus to the soup. This is what sets it this Fall Harvest Soup apart from others you may have tried. 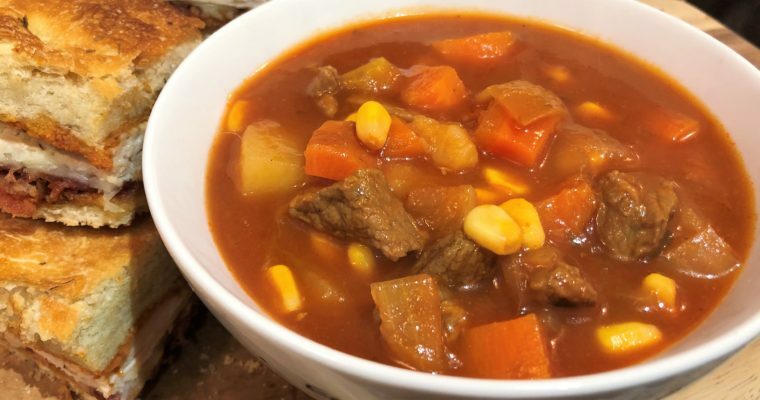 My family is split on soup, some love it, and others don’t, but I still like to make a big batch of soup every week, and for those of us who love it, we have it for snacks or amazing lunches. Soups reheat so well and I often just round it out at lunch time with a salad. 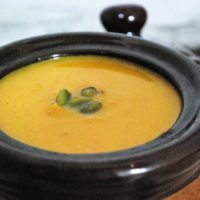 This particular soup is pureed; and I really like the texture however if you find it too thick when you’re cooking it, that can easily be adjusted. Simply add more stock, or a little water until the desired consistency is reached. 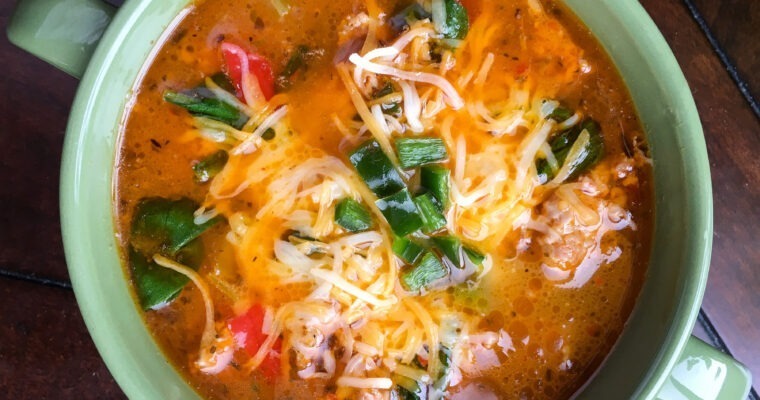 By using coconut oil in this recipe, it is Keto friendly, and if you wish it can also be vegetarian by substituting the Chicken Broth with Vegetable Broth. If you want to get super healthy and budget friendly make your own Vegetable Broth. I do this often, and you can definitely taste the freshness in the homemade stock. And last but not least, I like to serve this delicious Roasted Fall Harvest Soup in ceramic bowls, it adds to it charm, and I like my food to look as good as it tastes. Preheat oven to 400°F and line a large baking sheet with a piece of parchment paper or a Silpat® baking mat. Set aside. Combine butternut squash, apples, red onion, ginger, cinnamon, nutmeg, cloves, allspice, and melted coconut oil in a large bowl. Season with salt and black pepper, to taste, and toss to combine. Spread seasoned butternut squash mixture onto prepared baking sheet and spread into a single layer. Place in pre-heated oven and roast until squash is fork tender, approximately 25-30 minutes. Remove from oven and let cool slightly before transferring one quarter of the roasted veggie mixture to a high-powered blender. Add one cup of chicken broth to container and blend until smooth. Add a little more broth, if necessary, to reach desired consistency. Transfer puree to a large soup pot and repeat process with remaining vegetables and chicken broth. Turn heat to medium and cook, stirring frequently, until soup is heated through, approximately 5-10 minutes. Remove from heat and adjust seasonings, as desired, before serving. Enjoy!